Financing real estate can be one of the biggest challenges for both new and experienced investors alike. How would you like to learn where to get ALL the money you will ever need to fund your real estate transactions without waiting to qualify for conventional financing? And, How would you like to learn the exact techniques one highly successful local real estate investors uses to grow his real estate business. And, how would you like to find and persuade private investors–even if you've never done a deal? “Private Money” is funding that comes from private individuals, friends, family, IRA’s or any source other than institutional or conventional means. 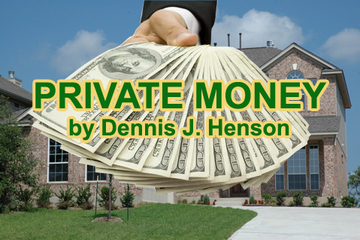 Finding private money is not near as difficult as people think. It’s hard to believe if you are sitting there with bad credit, and no cash to do deals. Dennis will be here to show you why you can have all the money you need for a deal and never use your own capital. Once you learn where and how to find private money you may be able to borrow 100% of the purchase price, rehabbing and closing costs. If you’re serious about making deals happen in 2016, you will not want to miss this information packed meeting. So if you would like to alleviate one of the Biggest Bottlenecks in most investors’ businesses…”continuing to find money to purchase more deals,” grab a spot for yourself today as seating is limited for this exclusive event. Dennis Henson is President of Vanguard Marketing and Investments, Inc, and the AREA (Arlington Real Estate Association of Investors). He is the inventor of EvaluateMyDeals.com, and the author of “Becoming Wealthy in Real Estate” an Investor’s Guide to Riches.